Much of Centre for Cities’ work on the high street has shown how important city centre jobs are to the performance of retail and other local services around them. However, we know comparatively little about how these urban workers use the wider city centre. How long are they there for? How does this change by the time of day or the day of the week? What are they most likely to be doing while they’re there? This is where big data can shed new light. With the help of Locomizer, we are taking our first steps in answering some of these questions and understanding our cities as places of consumption. Using anonymised mobile phone data for the fourth quarter of 2017, this blog looks at the daily movements of workers in Manchester and Sheffield city centres. The data shows that despite covering the same area (a circle with a radius of 0.8 miles), there are roughly twice as many workers in Manchester as there are in Sheffield on a weekday (115,000 as against 58,000). We also find that people travel further – in fact, twice as far – to work in Manchester city centre as they do in Sheffield. Questions are often raised about how representative big data sources are. Benchmarking our figures against census data corroborates the above findings, however. In both city centres, more people commute to work between Tuesdays and Thursdays. 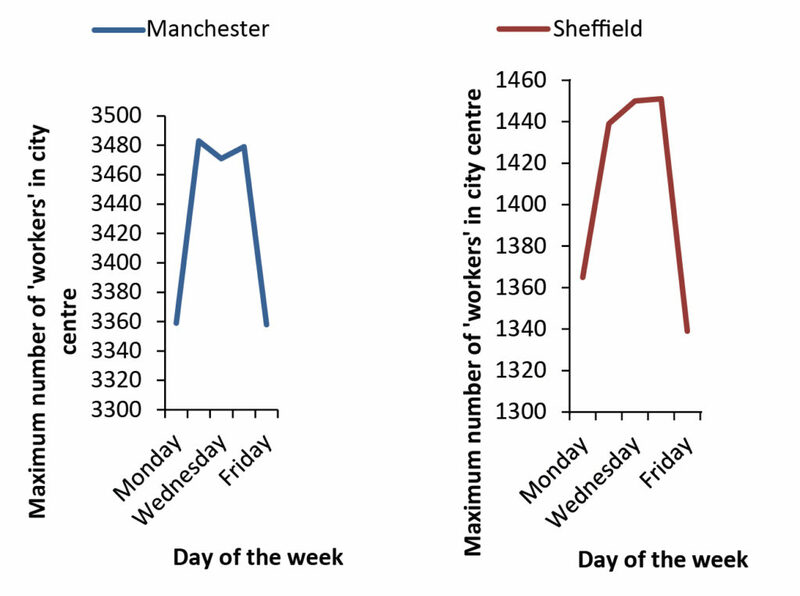 In Manchester, there was a 4 per cent difference between the most popular day for commuting and Friday, which was the least popular working day, while in Sheffield the difference was 8 per cent. This figure is likely to reflect both working-from-home and part-time working, with workers doing so extending their weekends. Not only does the data reveal the total number of people in the city centres, but it can estimate what they are doing while they’re there. It shows that, unsurprisingly, the use of shops and food outlets peaks in both cities between 12 and 2 pm when people step away from their desks to grab lunch or run an errand. This increase is much higher in Manchester city centre than it is in Sheffield, demonstrating in part why the high street performs better in Manchester city centre than in Sheffield. 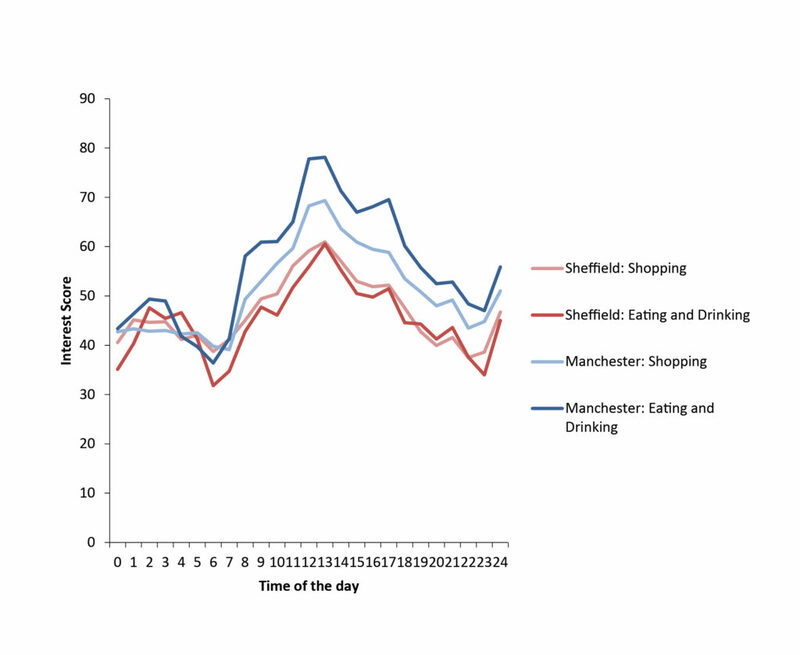 These scores also indicate that interest in Manchester is more skewed towards eating and drinking than in Sheffield, reflecting the move towards spending on experiences and also away from shopping in stores. As well as providing a market for high street companies to sell to during the day, these workers also provide a market for bars and restaurants in the evening. Looking at the number of workers across the day shows that the fall of these workers is slower as we progress through the week, with this drop off being slowest on a Friday. 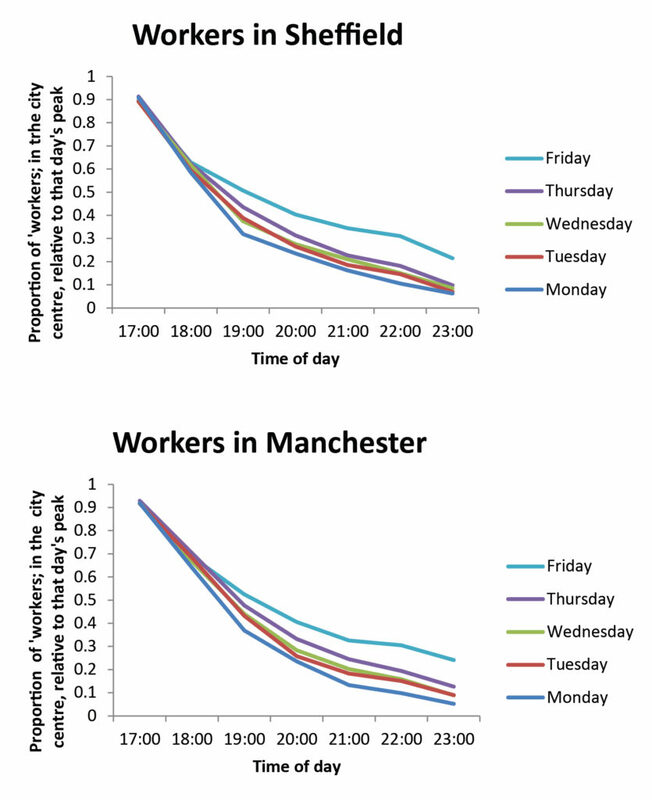 As figure 3 shows, the trends in the two city centres are very similar, with the number of workers still in each city centre at 8 pm being around 40 per cent of the peak number of workers that are there on a Friday. But once again volume is important here: 40 per cent of Manchester’s population is naturally a much bigger number than the same proportion in Sheffield. This again provides a larger market to sell to. 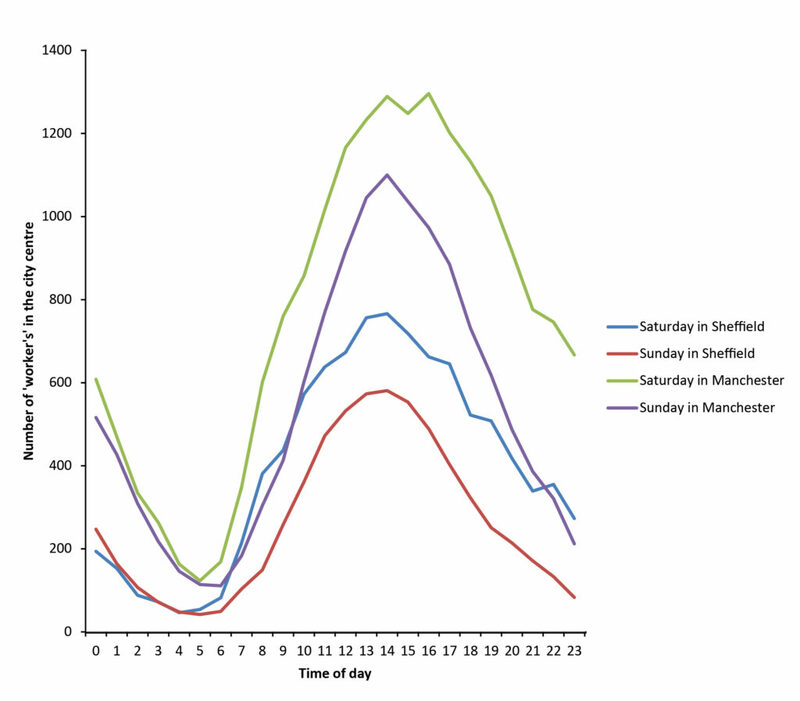 A reasonable proportion of workers actually come back into the city centre on the weekends – about a third in Manchester and about half in Sheffield. Even then, as Figure 4 shows, this translates into higher footfall for Manchester city centre, given its larger base. Figure 5 shows that, once again, interest in all ‘leisure’ activities is consistently higher in Manchester than in Sheffield. 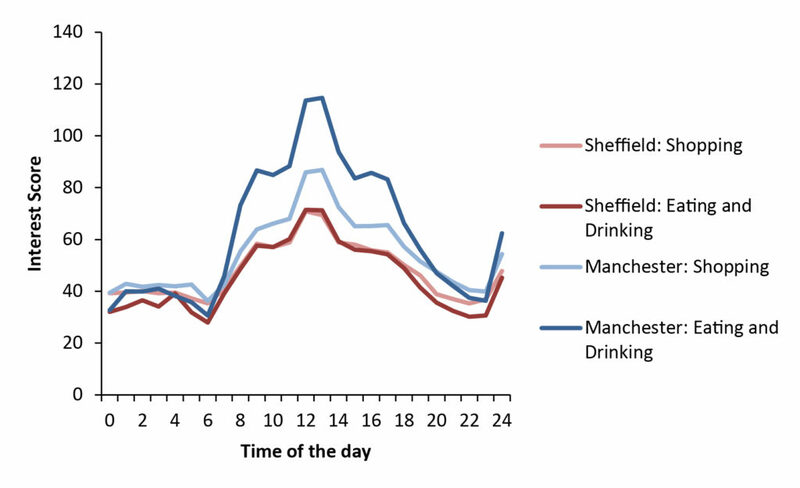 More specifically, we see that people spending time in Manchester city centre are more like to eat and drink than shop whereas in Sheffield these activities are roughly equivalent. This holds true irrespective of the time of day. While only profiling two cities, this data provides greater detail on the way that workers support the high street nearest to them, and why the performance of high streets varies across the country. Big data has the potential to offer both more detailed and more timely insights into the performance of city economies. We’ll be doing more work on this in 2019 when we look at the role that our cities play as places of consumption.